A baptism is a special day in your child’s life, so it’s a must to dress up your little girl beautifully! It marks the beginning of their life of faith, and often draws family together to celebrate the day. Throughout the day there will be countless opportunities to take photos of the family so you that they can look back on the day for their whole life. Knowing that the photos will be displayed for years, you’ll want to dress your child in something nice, stylish and traditional… that’s where baptism gowns and dresses come in! Whether you’re wanting to find a gown that is completely traditional or you want to go for a dress that’s more on trend and stylish, shopping for baptism dresses doesn’t have to be difficult. There are many styles available to you, both online and in stores. Decide what direction you want to go in terms of style, and start shopping! 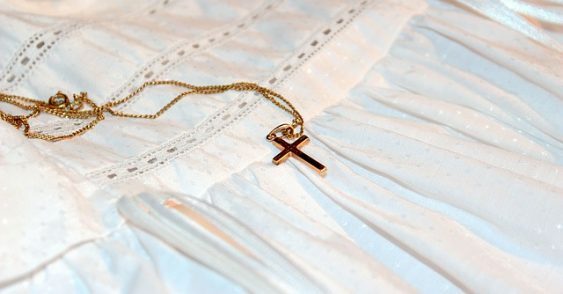 What’s the difference between a baptismal gown and a baptism dress? Most assume that gowns and dresses refer to the same general style trend, but when it comes to a child’s baptism, they actually mean something a little different. Generally speaking, they both serve the same purpose: to welcome a child into a life of faith in the colour of innocence & purity. A gown is more traditional than a dress and is typically much longer than the child. Often these gowns are passed down within the family, so they tend to hold a strong family history. A baptismal gown might be hand stitched, embroidered with familial symbols (like celtic knots or crosses for Irish families), or adorned with lace or beading. Baptismal gowns can be very ornate, elaborate gowns or have a much simpler, classic design. A baptism dress is typically any pretty, white dress. You can choose from pretty much any style, from simple white satin to something embellished with a coloured sash, beads, lace or tulle. A baptism dress can be long, short or in between. Any style you think would look great on your girl is the perfect choice! With the days of social media memories apparently here to stay, helping your girl look her best on her baptism day is a role of significant importance. These photos will be shared and displayed for years to come. Choosing a dress that is both stylish and classic is a task that is not to be taken lightly! Whether you opt for a traditional baptismal gown or a more modern baptism dress, your little girl is sure to be the center of attention the whole day through. Shopping online is a growing trend for pretty much everything you can think of nowadays. This works in your favour here though, because you can also shop online for the perfect baptism dress or gown! Once you have an idea whether you want to buy a baptismal gown or a dress, you can easily find what you are looking for online and have it sent right to your front door. Dress shopping for your child doesn’t have to be as difficult as it is for an adult! At the end of the day, regardless of whether she wears a gown or a dress, your little girl is going to shine on her baptism day, and it will be a day you and your family will look back on with happiness. Spending time together with family to honour the life of faith your young one is embarking on is really what it is all about. Her dress is just icing on the cake!